Meet your mitochondria.1 With a laundry list of responsibilities ranging from creating energy to determining the time of a cell’s death, mitochondria have increasingly become the focus of chronic disease research. 2 Mental illness is often the assigned diagnosis. The keeper of our mitochondria is our thyroid hormone.3 This is why, when thyroid hormone is deficient or poorly functioning, patients experience an array of symptoms, including fatigue, constipation, hair loss, depression, foggy thinking, cold body temperature, low metabolism, and muscle aches. How much of what we call “mental illness” is actually thyroid-driven? In my experience, a vast majority, and certainly enough of a subset to warrant a more sophisticated appreciation for proper diagnosis and treatment in these patients. Thyroid health is so much more than pumping out a hormonal product – it is a sophisticated conversation between the brain, gland, hormones, and the receiving cells and tissues. This circuitry is at the mercy of yet another hormone, cortisol, 4 produced by your adrenal glands, signaled by your brain. This is why hypothyroidism can also look like anxiety, palpitations, insomnia, and sweating, and why one person may feel restored on thyroid hormone and another decimated. Once we ask about the state of adrenal function, we have to dig a step deeper and ask what is taxing the adrenals. From this point of inquiry, we are typically talking about gut, diet, and environmental immune provocation. This is the model of medicine that prizes root-causes, considerations like gluten enteropathy, sugar imbalance, fluoride toxicity, and iodine deficiency as potential drivers of thyroid hypofunction. The many lifestyle and environmental factors that can influence this relationship are prime examples of the web-like, whole mind-body approach that medicine must take in an effort to truly reverse pathology. The aspect of mental illness as a first diagnosis is outdated. When patients are tested for thyroid pathology, typically at their own request, they are often confronted with “reference range” rejection – physicians staring at numbers instead of the suffering humans before them. Reference ranges that bracket your lab results are based on unscreened and clinically unassessed populations (many were active hypothyroid patients), never calibrated for diagnostic practice. Doctors are trained to look at a brain hormone – TSH – as an absolute indicator of whether or not a patient is living in a glandular hormonal deficiency state. Dysfunction of the endocrine system at large is totally ignored by this metric that “diagnoses” only the lowest 2.5 percent of those in a given reference range, as hypothyroid, without looking at the whole picture of their hormone activity. There is also neglect for the significance of antibodies as a relevant indicator of endocrine/immune dynamics, and consideration of autoimmune drivers. For those who do receive the label of hypothyroid, they remain obliquely objectified by their lab work as their doctors use synthetic T4 – Synthroid – to attempt to move their TSH within range, more often leaving them symptomatic but “treated” because of poor conversion to active thyroid hormone (T3) and suppression of natural T3 production because of their now lower TSH. When patients are denied appropriate hormonal treatment, it can be a slippery slope to medications for their remaining symptoms, and one category of medications in particular – psychiatric. Psychiatry is often positioned to slap Band-Aids on the festering unwashed wounds of the population. When these patients are told that they are “fine” or “treated” but they continue to feel unwell, they are sent to a psychiatrist, or started on psychotropics by a nonspecialist. Are many psych patients actual thyroid patients? In the case of depression, there is much dispute as to the significance of hypothyroidism in presentations of classical and treatment resistant cases. Estimates of “subclinical hypothyroidism” (where free hormones are low, but TSH is normal) are up to 52 percent in the resistant population,8 which is demonstrative of the importance of looking beyond TSH. The specific suppression of free T3 levels in depressed patients has been evaluated in several studies including those which specifically identified poor conversion of T4 to T3 in depressed women who were less likely to improve with standard medication treatments.9, 10 In 10 years after initial hospital admission, those with evidence of thyroid dysfunction through a stimulation test (TRH) were significantly more likely to relapse.11 Antibodies to thyroid tissue are also present in 20 percent of depressed patients,12 as compared to 5-10 percent of the general population. In both bipolar and unipolar depression, there have been six randomized, placebo-controlled trials conducted wherein thyroid hormone was used as an augmentation to an incompletely effective antidepressant (tricyclic) and found to be effective, particularly in women. In the STAR*D report,13 the largest and most expensive trial ever conducted on antidepressant treatments, T3 was found to result in remission in 24.7 percent of patients. Perhaps the best studied population when it comes to the predictive role of thyroid abnormalities, pregnant and postpartum women deserve the most vigilant screening. Of 31 inpatient women with a diagnosis of postpartum psychosis,14 19 percent had detectable thyroid autoantibodies and 67 percent of these women developed thyroid dysfunction by six months as compared to 20 percent in the controls. TSH at delivery has been shown to be a predictor of postpartum depression at six months postpartum.15, 16, 17 Even in the setting of “normal” TSH levels, thyroid autoantibodies are predictive of postpartum depression and anger18, 19 including in prospective trials.20, 21 Risks of hypothyroidism include adverse pregnancy outcomes such as hemorrhage, preeclampsia, fetal cardiac rhythm anomalies, and labor abnormalities.22 Thyroid antibodies, once again, represent a significant risk factor, not just for psychiatric pathology but for tripled odds of miscarriage and double of preterm birth.23 Importantly, in one randomized, placebo-controlled trial,24 supplementation with 200 micrograms (mcg) of selenium during pregnancy reduced antibody activity and improved hormone parameters likely owing to selenium’s antioxidant properties in thyroid tissue. Birth control pills:29 The synthetic hormones in this pharmaceutical product increase thyroid hormone binding globulin, effectively lowering available thyroid hormone even without perturbing lab values. Fluoride:33 Historically, fluoride was used, even in the milligram range, to suppress thyroid function in hyperthyroid patients. It interferes with multiple aspects of thyroid tissue integrity, hormone activation, and displacement of iodine, a critical and essential mineral for thyroid function. Endocrine disruptors:34 From exposure in utero, 35 industrial and agricultural chemicals such as phthalates, flame retardants, and PCBs are pervasive toxicants that interfere with the hypothalamic pituitary adrenal signaling, stimulating the immune system and derailing hormones. Clean up your mind: initiate a meditation practice to heal your adrenals and promote anti-inflammatory signaling. 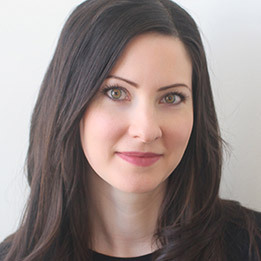 Kelly Brogan, MD, is boarded in Psychiatry/Psychosomatic Medicine/Reproductive Psychiatry and Integrative Holistic Medicine, and practices Functional Medicine, a root-cause approach to illness as a manifestation of multiple-interrelated systems. After studying Cognitive Neuroscience at M.I.T., and receiving her M.D. from Cornell University, she completed her residency and fellowship at Bellevue/NYU. She is one of the only physicians with perinatal psychiatric training who takes a holistic evidence-based approach in the care of patients with a focus on environmental medicine and nutrition. She is also a mom of two, and an active supporter of women’s birth experience, rights to birth empowerment, and limiting of unnecessary interventions which is a natural extension of her experience analyzing safety data and true informed consent around medical practice. She is the Medical Director for Fearless Parent, and an advisory board member for GreenMedInfo.com and Pathways to Family Wellness. She practices in NYC and is on faculty at NYU/Bellevue. 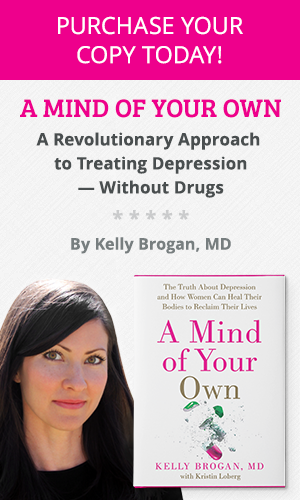 Follow her on Facebook and her website, KellyBroganMD.com. This article originally featured on Mercola.com. Questions or anything to ask Dr. Brogan about mental illness? We want your thoughts in the comments section–Please!